ETA’s best feature is actually a way to never open the app itself. 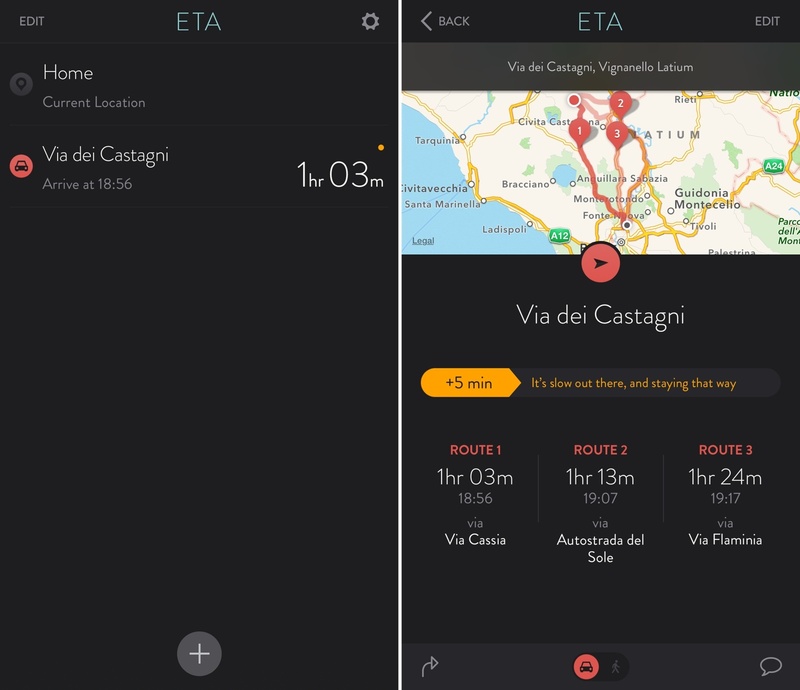 Taking a clue from Apple’s Today Summary in Notification Center, Eastwood created an iOS 8 widget that lets you see driving times in the Today view and tap them to quickly load directions in your mapping app of choice (Google Maps, Apple Maps, or Waze). Your preferences for walking/driving directions and time of arrival are carried over to the widget, which is simple, elegant, and useful. 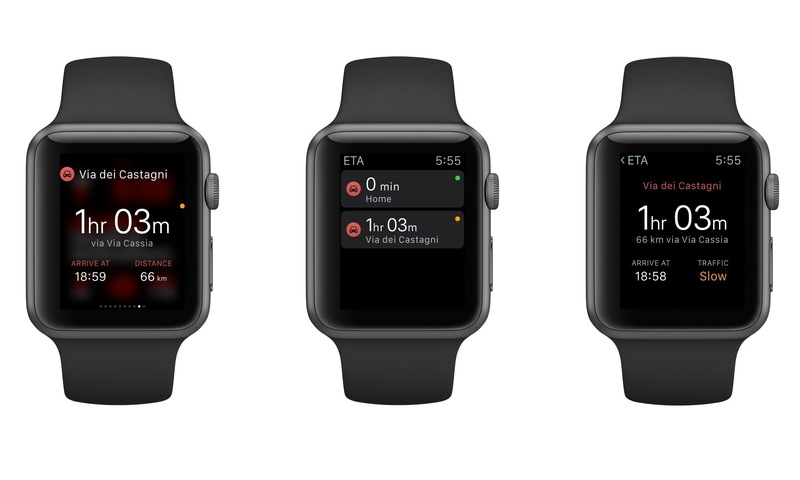 Today, ETA 2.0 has been released with a new design, the ability to show multiple routes and traffic information, and an Apple Watch app that lets you quickly view travel times and traffic directly from your wrist. Like Take Me There, ETA lets you configure locations you're frequently visiting, but it puts the focus on the estimated time of arrival so you can instantly know when you'll arrive at a location if you leave now. This core aspect of the app hasn't changed, but now the app can also tell you whether traffic is slow or if you can leave now and hope to arrive at a place with no considerable delays. To do this, the app employs a colored dot (green for no heavy traffic, orange and red for slow traffic) and a tweaked interface that shows traffic details and multiple routes. You can still switch between walking and driving directions, and the entire UI has been refreshed to clearly indicate routes and traffic. I like how ETA looks and how information is laid out on screen with a thoughtful use of icons and different colors. On Apple Watch, ETA has a useful glance that puts essential data just a swipe away from the watch face. You can choose in the main Watch app which address you want to show in the glance, which will display estimated travel time, traffic status, distance, and time of arrival. If you tap the glance, you'll be taken to that location in the Watch app, which has a Maps preview you can tap to get directions in the Maps app on your device. I've spent about a week testing the new ETA, and I found its traffic predictions to be accurate in Rome and Viterbo. I would have liked to see notifications for slowing traffic and suggested alternative routes as I'm driving, but even without those I relied on the glance (with my iPhone plugged into my car's dashboard) to quickly peek at time of arrival and make better decisions about the route I was going to choose. Like Fantastical, ETA 2.0 is an example of how to make a great glance for Apple Watch. Useful travel and traffic information is shown in a single screen, which tells me how long it's going to take me to get somewhere without navigating into Apple's Maps app or guessing based on the traffic I see in front of me. ETA 2.0 is available on the App Store.